Cambium seat is used on a Specialized single-speed for last 2 months. Seat (C19) is slightly wider than C17 and very comfortable. Seat has good flex and the cut-out does its job. I have a Brooks B17 on a road bike which took approx. 400 hundred miles to break in, this seat has a similar feel out of the box. I like that the Cambium seat can get wet. No fuss ready right out of the box, zero, and super comfy. Just what you would expect from a Brooks saddel except without having to oil your saddel. Definitely recommend this for anyone touring or with an urban commute. 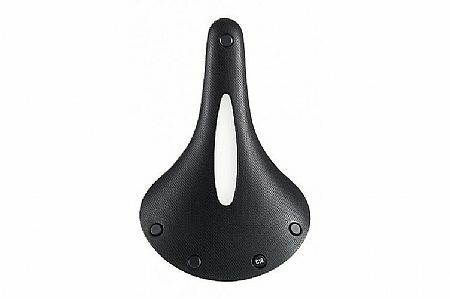 Well constructed Brooks quality saddle. No break-in period or periodic maintenance required. Comfortable right out of the box. Seems to be very durable. I have ridden a few saddles with carved or indented center slots and have found them to be beneficial. Finally, I really like the fact that water will not damage this saddle which makes it quite suitable for multiple day tour rides. Im a long time B17 and B67 user I love them, but the leather is not ideal for wet conditions. So I got an All Weather carved C19 for my touring bike. It works! While it does not have that leather saddle feel of the leather, I have noticed is not that it feels so good to sit on (although it feels fine)rather, I feel good, without pain when I am done. (Ive done several 80 mile rides on it). Im happy, and picky enough to not put up with or say otherwise when I dont like things. I tried my friends C17it did not work for me, but the wider C19 works for my upright posture. It does what it was designed to do, but it's not for me. Any complaints I have against this item is more a reflection on me than the product. The product description explicitly states that the saddle is designed for an upright riding position. My riding positions are all over the place. I go from upright to aerobars and back. In doing so, the seat cover grabs your shorts and makes sliding impossible. This is not a seat you would want to use on a racing bike. If you are locked into an upright position, this could be the seat for you. Brooks have been making bicycle saddles for a long time. There is no questioning the quality of the construction. It comes in various widths, up to 19 mm, wide enough to accommodate the widest tracked posterior. I am keeping the seat. Im thinking of buying a bike to fit the seat. Used for the purpose for which it was designed, my ratings would undoubtedly have been higher.